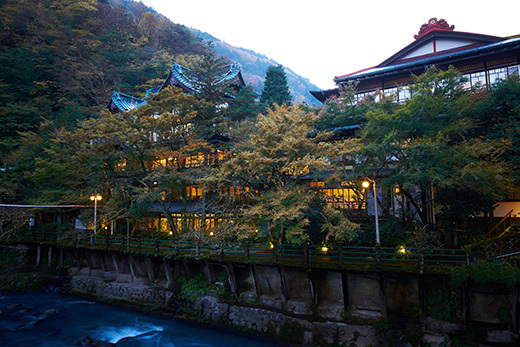 Hakone is a hot spring resort that is quickly accessible from downtown Tokyo. To get to Hakone, you can take the JR Line Shinkansen (Bullet Trains) from the JR Tokyo Station, or from the JR Shinagawa Station, or using the Odakyu Line from Shinjuku Station in downtown Tokyo. The most convenient nearby station to come Kansuiro, is the Hakone Yumoto Staion. There are several ways to come to Hakone from Tokyo. To come to our Ryokan, Hakone-yumoto is the most convenient station. Narita Airport - (JR Narita Exp. 85 min. 3,110 Yen) - Shinjyuku St. - (Odakyu Line Ltd. Exp. Romance Car 90 min. 2,020 Yen) - Hakoneyumoto St.
Narita Airport - (Airport Bus 85 min. 3,000 Yen) - Shinjyuku St. - (Odakyu Line Ltd. Exp. Romance Car 90 min. 2,020 Yen) - Hakoneyumoto St.
Narita Airport - (JR Narita Exp. 60min. 2,940 Yen) - Tokyo Station (The Shinkansen 40 min. 3,130 Yen) - Odawara St.- (Hakone Tozan Railway 15 min. 300 Yen) - Hakoneyumoto St.
Haneda Airport - (Keikyu Line 25 min. 470 Yen) - Yokohama St. - (JR Tokaido Line 60 min. 950 Yen) - Odawara St.- (Hakone Tozan Railway 15min. 300 Yen) - Hakoneyumoto St.
Haneda Airport - (Keikyu Line 20 min. 400 Yen) - Shinagawa St. - (The Shinkansen 35 min. 2,960 Yen) - Odawara St.- (Hakone Tozan Railway 15 min. 300 Yen) - Hakoneyumoto St.
From Hakone-yumoto Station, you can take a regular shuttle bus. Please take a bus bound for "Tonosawa-C Course". This shuttle bus stops in front of our Ryokan(a 5 minute ride). The fare is only 100 Yen. From Odawara Station, you can also take a bus. Approx 25 minutes ride. Get off at the bus stop Kami-Tonosawa (in front of our Ryokan). From Tonosawa Station (Tozan Railway), it is a 5 minute walk to our Ryokan.